Poeme is a newest and most well-built Multipurpose Theme suitable for Fashion, Food, Home Rugs, Pottery, Vegetarian Seeds u0026amp; Nuts, Decoration. 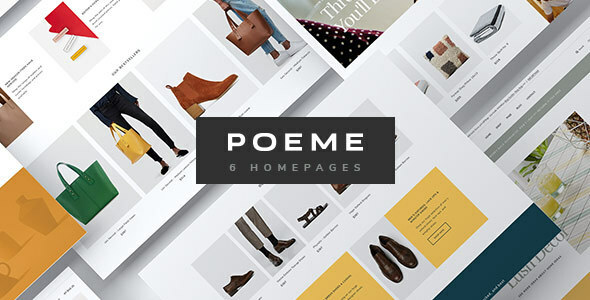 As an Elegant u0026amp; Functional WooCommerce WordPress Theme, Poeme possesses many amazing features that meet your expectations for helping you to build up and develop your own website professionally in a short time. This great Theme is so impressive with 06+ Modern, Charming Homepage Demos creatively designed by the powerful Elementor Page Builder with Drag u0026amp; Drop Widgets struck with Diverse eCommerce functionalities. Scroll down to explore how wonderful Poeme is and how passionate we stuff on it! Why do you fall in love with this Universal – Smart Multi-purpose WordPress Theme? Compatible with WooCommerce 3.4.x, WooCommerce 3.3.x, WooCommerce 3.2.x. Poeme has been tested with browsers IE10, IE11, Firefox, Safari, Opera, Chrome.